In 2014, there were some changes to our show space at Windsor Fair. The section of the exhibition hall where MGS has been holding its annual show for my entire lifetime had a new dividing wall in it, to make room for 4H and University of Maine agriculture exhibits. 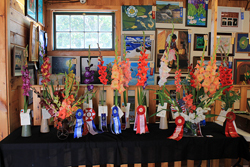 The amount of glads shown at MGS exhibitions has declined in the last decade or two as exhibitors have passed away or moved away, and so even though the space was smaller, we fit just fine. As per usual, we arrived around 9 AM on the morning of Sunday, August 24th, to prepare the show. As per usual, as "voluntold" show chair, I spent most of the morning running glads from the Cates setup table to the proper categories, and then arranging the glads already out on the tables according to class. We were... mostly done by the time noon rolled around, when judging was slated to begin. Former Waterville, Maine florist David Bolduc pinch-hit as judge, after our predetermined judge fell through due to family obligations at the last minute. Luckily this was not David's first time to the rodeo, having judged our show in 2012 and 2013, and we appreciate his willingness to help us out on such short notice. We started with arrangements. 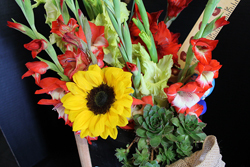 Vicky Mosher's "Leaf Peepers" basket took home the champion design rosette, while her "Politician" arrangement took second place. Vicky has been our #1 designer for the last few years -- not only because she's very creative in interpreting the design categories, but also to some extent because she's been our only designer. Our design competition is open to any designer with any level of experience. Anyone want to show up in 2015 and give Vicky a run for her money? In open competition, there were three mini (100-200 size) glads exhibited, so David judged them all together. Cates seedling Little Red Hen took home best mini overall, as well as best 100-size. Arthur Mosher's spike of Hartline's Super Cross (which was so huge and healthy it could've been snuck into the 300s!) took home best 200-size and mini runner-up. Best 300-size went to Cates' Midnight Moon, with Cates' Sumerki close behind. Cates took best 400-size as well, with Cloud 9, and Mosher's Lingerie took home the runner-up ribbon in that size class. Mosher's High Brow was judged best 500-size, as the only 500-size glad exhibited -- but it was a nice one! In the All-America category, Starry Night was the star of the show. Allegro, which has done well in the Maine show in the past, was judged to be the best old-timer. On the People's Choice table, it was Deneb Exotic by a landslide, proving once again that if you put something stripey in People's Choice, it'll win. Past People's Choice victories of Candy Cane and Rembrandt are more evidence of central Maine's preference for stripes. It was Cates' Cloud 9 spike that took home the whole enchilada in 2014, winning not only Grand Champion of the show, but taking the champion 3-spike ribbon as well. Cates' Allegro 3-spike took home second place status in that competition, and Mosher's enormous, healthy Super Cross was 2014's Reserve Champion. 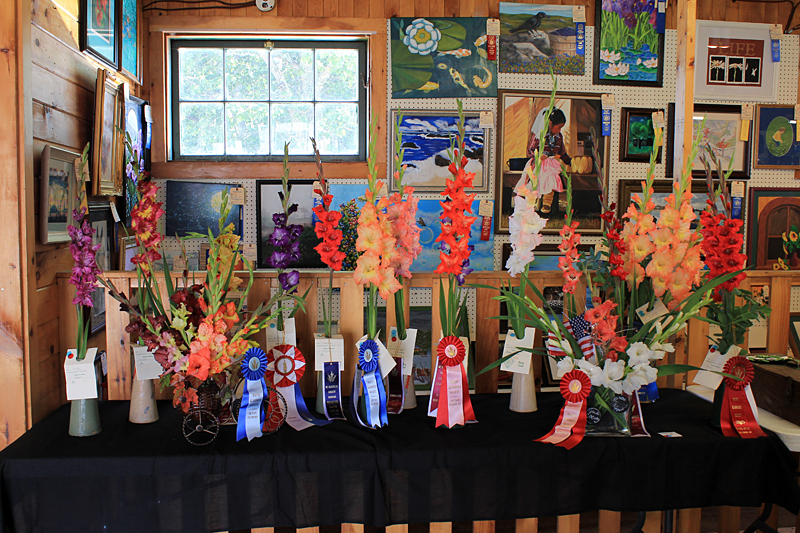 We have hopes for more exhibitors in 2015's show!